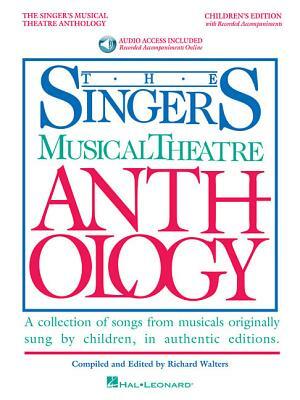 Singer's Musical Theatre Anthology - Children's Edition: Book with Online Audio [With MP3] (Hardcover) | The Drama Book Shop, Inc.
(Vocal Collection). This volume of the Singer's Musical Theatre Anthology series is specially designed for child theatre singers, with songs originally sung by children, in authentic editions. The collection features a mix of classic and contemporary songs and includes plot notes on each show. The professionally recorded piano accompaniments are accessed online using the unique code inside each book and can be streamed or downloaded. The audio files include PLAYBACK], a multi-functional audio player that allows you to slow down audio without changing pitch, set loop points, change keys, and pan left or right. Contents: THE ADDAMS FAMILY: What If * ANNIE: Maybe * I Don't Need Anything But You * You're Never Fully Dressed Without a Smile * ANNIE WARBUCKS: I Always Knew * BILLY ELLIOT: Electricity * Expressing Yourself * THE BOY FROM OZ: When I Get My Name in Lights * A CHRISTMAS STORY - THE MUSICAL: Counting Down to Christmas * Red Ryder Carbine Action BB Gun * Somewhere Hovering Over Indiana * FANNY: Be Kind to Your Parents * FROZEN (film): Do You Want to Build a Snowman? * GYPSY: Let Me Entertain You * INTO THE WOODS: I Know Things Now * Into the Woods * THE KING AND I: Getting to Know You * I Whistle a Happy Tune * MAME: My Best Girl * MATILDA THE MUSICAL: Naughty * Quiet * When I Grow Up * LES MISERABLES: Castle on a Cloud * Little People * THE MUSIC MAN: Gary, Indiana * NINE: Getting Tall * OLIVER : Where Is Love? * Who Will Buy? * RUTHLESS: Born to Entertain * THE SECRET GARDEN: The Girl I Mean to Be * Round-Shouldered Man * SEUSSICAL THE MUSICAL: Green Eggs and Ham * It's Possible (In McElligot's Pool) * SHREK THE MUSICAL: I Know It's Today * SOUTH PACIFIC: Dites-Moi (Tell Me Why) * TARZAN: I Need to Know.